The headlamp lumen arms race takes another step with the newest release from Acebeam the H30 Headlamp. The previous brightest headlamp I had had has been the Thrunite TH30 at 3300 lumens. The Acebeam H30 is 4000 lumens, contains a 21700 battery, and has USB-C charging and can act as a power bank. Thanks to Acebeam for sending this to me to take a look at. The packaging is a compact full color retail box. The front advertises the big lumen number, USB-C and the 21700 battery. The back gives lots of stats. Inside The light came in a plastic bag on one side with the 21700 preinstalled. On the other side were the other accessories such as the headband, spare orings, and a USB A to USB-C cable that also has a place to plug a cable to charge your phone along with a warranty card, instruction manual, and certificate of authenticity. I do wish it came with an adapter tube like some other 21700 battery lights I have, so you can run an 18650 assuming the springs are long enough. The light itself is made from aircraft grade aluminum and is hard anodized in a satin black. Starting at the left end cap, this is the one that gives access to the Acebeam branded 21700 button top battery. It’s got markings indicating it’s where the battery is and which way to twist for open and close. The knurling on the outside of the cap is more for looks then grip. Each end is spring loaded. The cap end has a large stiff spring. Threads were well greased, anodized, and square cut. The bore for the battery is not perfectly centered in the body of the light, with a bit more mass being on the emitter side. This is similar to how the Jetbeam HR30 that I reviewed this year was. The right side cap is similar in appearance however this is where the USB-C charging port lives and the cap is notated as such, again with directions. You must fully remove the cap to access the charging port. There is a little pin in the center under the clear plastic cover which must be for grounding? When the light is charging a red LED comes on. When being used as a powerbank you get a blue LED. The central body is where the business is. On top are the two UI buttons, an orange square that is an on/off mostly, and a black domed circle. The back of the light has some shallow ribs for cooling. The front has the main emitter in the middle, It’s a big XHP 70.2 emitter in what’s a fairly shallow orange peel reflector. The front glass is just 19mm in diameter. Above and to the left and right of the main emitter are the colored emitters. On the left is red, and on the right is green. These are behind frosted plastic lenses. The front aluminum piece is held on with 3 recessed hex screws. It may seem like a simple thing but I like that the headband on the H30 came pre assembled and ready to use right out of the box. On the outside band Acebeam is written in several places, it does contain a over the head strap too. On the inside of the band there are silicone strips all the way around to help keep the light in place on a helmet or something like that. It’s a nice step over not including any or a partial. The holder for the light itself is made of a silicone rubber. It has too large hoops that go over each end of the light when the caps are off. This is a pretty tight fit and not the easiest to take on or off, but holds firm for rotation. Pretty nice headband. Overall length is 89.5mm, at it’s narrowest on the end caps are 29mm, and the widest at the center tube at 39mm. Weight with strap, and battery came in at 182g which makes is on the heavy side. This weight is noticeable but carries fairly well with the top head strap adjusted. For the main emitter the Acebeam H30 uses a Cree XHP 70.2 LED in cool white at 6500k. It sits behind a piece of anti reflective coated glass, and a shallow orange peel reflector. The beam pattern is similar to other XHP 70.2 but without the donut at short ranges. It does have some Cree rainbow on the corona of the hotspot, it goes a bit warmer. As you keep going further out into the spill it cools off. It looks like a few other LED options may be coming, like a 5000k main emitter, and a Nichia UV emitter, or Nichia 219C for High CRI for the secondaries. White is available in the following lumen spacing. 3 lumens, 120 lumens, 380 lumen, 1100 lumen. Turbo is good for 2200 lumens for 5.5 minutes then it drops down to 1000 lumens for about 2.4 hours. The light also has Turbo Max which has 4000 lumens for 1.5 minutes then drops to 1000 lumens for 2.5 hours. is a long runtime for 1000 lumens. The 21700 5100mAh battery shows it’s advantage here over an 18650. Heat was pretty well controlled. The light gets on the upper end of warmish but never uncomfortably hot when on the head. The Red Emitter is a Cree XPE2-R2 emitter at 630nm. Red has only one mode at 50 lumens but is diffused very well. It’s runtime is 10 hours. It has no hotspot. I would prefer a dimmer red mode for up close map reading because 50 lumens is fairly bright. Green Emitter is a Cree XPE2-G3 emitter at 530nm. It’s rated at 70 lumens for a runtime of 11h. It’s diffused very well and has no hotspot. The H30 has 2 buttons on the top a circle and a square next to each other for UI control The Square is flat, and the circle is domed a bit. Depending on what color mode you are in the buttons do slightly different things. For normal white operating modes, the orange square is On/Off. When the light is it comes on in the last previously used mode. Use the circle to go up in mode up to Turbo (Not Turbo Max). Double click the square to go to Turbo Max (Full 4000 lumens). Triple click to go into the Red SOS mode. When in any mode long pressing on the circle (about 1.5 seconds) will go into the color modes. A short press of the round button will switch color modes (Red to Green, Green to Red), and a long press of the circle will move back to white mode at low output. Moonlight mode is also available if you hold the square for about 1 second when the light is off. Overall the UI takes a little getting used to. I think 2 buttons make sense. *Recharging: *This light has a USB-C port under the right side cap. You must completely remove the tailcap to access the port. Maximum charging rate I saw while charging from an empty battery was an even 2A. This is great to see and speed the charging process up but it still took 3 hours and 23 minutes to charge the battery to completely full. While charging there is a red LED in the center of the light that goes solid when completely recharged. The included Acebeam branded battery is a button top but flat top cells work too, for all functions of the light. Standard USB A to USB-C cables work or the cable that’s included. What was odd and I am seeing on more and more USB-C flashlights are that they seem to have a problem charging with USB-C to USB-C cables/power sources. The H30 is no different. I tried charging it using an Anker USB-C to USB-C cable and a couple of different charger I have that support USB-C and none work. If I used a USB-A to USB-C charger it works without an issue. *Powerbank: *This light can also be used as a powerbank. Included was a special USB-C cable that has a female USB A port on it to allow you to plug in another cable (Not included) to charge your phone or other device. I was able to pull 2.5A from a full battery for a while, but the light is happier pulling 2A for a longer time. When using as a powerbank you get a Blue LED under the plastic cover showing which way the power is flowing. Preassembled headband with silicone all the way around. On the heavy side – the top band helps when on the head. I would like an additional lower power red mode for map reading. USB-C to USB-C charging doesn’t work. Acebeam has built a flagship headlamp with the H30 that ticks a lot of boxes. The XHP 70.2 isn’t my favorite emitter due to the Cree Rainbow and beam pattern but if your not super picky I think you won’t mind. They have made a light that can sustain 1000 lumens for a substantial amount of time and burst up to 4000 lumens for short duration. The penalty you pay for this is weight. At 182 grams it’s on the heavy side but I got used to it, especially after adjusting the top head strap. I am glad USB-C is becoming more common on lights, and the extra powerbank feature here is a nice bonus. I think the Acebeam H30 is best for someone who needs a high output headlamp for a long amount of time, it certainly has significantly better runtime then some of it’s 18650 based counterparts. Thanks to reddit user /u/mcfarlie6996 for sponsoring a 20700 battery for me. I didn’t have one (Or have any lights that took them) and it was great to test how much more runtime you can get with minimal size and weight differences between an 18650 and 20700. Total runtime with the 2600mah 18650 that was included was 145 minutes, The total runtime on the Panasonic 4000mah battery was a very impressive 260 minutes. Thats 44.2% more run time for only an additional 14 grams in weight. Output curves were pretty similar between the two batteries with the main difference being that 55% relative output was about 220 minutes in length. With a 20700 battery it makes the JetBeam HR30 be the longest duration headlamp I have by a large margin. Today I have a new headlamp the Klarus Titanium H1A. This is Klarus’s first headlamp, and as you can see this is is a multi emitter headlamp, with multiple buttons. It’s a dual fuel headlamp running on the included LIthium 14500 cell or alkaline/rechargeable AA batteries. Thanks to FlashlightZ(link is external) for sending this to me to further look at. The front and side shell of the headlamp itself is made from Titanium. It has a brushed finish and seems to have a clear coat applied over top. On each side there are little rubber notches that are glued on/molded on that give it a little extra grip. On top the buttons are silver plastic and are different sizes that correspond to the different LED’s. The light pivots at the bottom and has 5 points of defined stops and a full 90 degrees. This is the easiest way to open the battery door and replace a cell. It clips on here at top. You can remove it from the strap which I like but I question if the all plastic pivot and mechanism can stand up to doing this repeatedly. Inside the screws and springs are gold in color. The battery compartment thanks to the spring can accommodate longer 14500’s but you do need a button top battery. Klarus markets the titanium in the outside of this light as being super durable, and very heat dissipation. While titanium is a strong and durable material it’s not the best for heat dissipation. Titanium has a relatively low thermal conductivity rating. For example Titanium has a rating of 19 watts per Meter C, Aluminum is 205-250 w/M C, and Copper is 386w/M C. In this the higher number is better means the material has better thermal conductivity and in this application that means it dissipates heat more efficiently. The benefit titanium has is that it’s very high strength for its very light weight which is why I suspect it was chosen here instead of it’s thermal properties. Klarus should just stress it’s high strength and lightweight instead of thermal properties. The head strap band is one of the nicest I have seen on a headlamp. It’s very elastic, and two tone. The outside is a gray with the Klarus name weaved into the fabric. On the Inside the band is bright orange which might aid in finding it in the dark or in low light. There is also a thin strip of silicone embedded into this inside of the strap. This helps you keep it on your head, and would help it stay put on a clean hard hart or similar helmet. Weight with strap and battery comes in at 96.6 Grams. Water rating is IPX6 rated. This means it will be just fine for rain and dust but not full submersion. This light takes a little different approach to others I have looked at recently by having 3 different LED’s. The main brightest emitter is a Cree XP-L V6 LED in cool white with a maximum of 550 lumens. It has 3 modes, High at 550 lumens, Medium at 100 lumens, and low at 30 Lumens. This emitter is almost all flood and even under the lens. The second white emitter is in the middle of the light, and is a Cree XP-E2 R2 LED with a warmer 4000k tone. It’s output is 50 Lumens on medium and 10 on low. This LED also has a Strobe feature at 50 lumens Lastly there is a Cree XP-E2 P2 Red LED that has one mode at 10 lumens and strobe at 10 lumens in red. I wish red had a lower lumen mode as it’s decently bright. On an alkaline or rechargeable AA battery the lumen outputs are the same except for Turbo which is 186 lumens instead of 550. You can run the main emitter and one of the smaller emitters at the same which is a little different. Runtimes are timer based it seems. The light doesn’t get beyond slightly warm when in use for long periods of time. This is disappointing on turbo since it only lasts for about 3-4 minutes You can bump up again but it requires a manual trigger. Runtimes in the middle mode with the main emitter on the included Klarus branded 750 mAh was much longer at about 55 minutes before it dropped off significantly with runtimes ending at the 80 minute mark. The light does have low voltage protection and working voltage is 0.9V to 4.2V. On a standard Enloop battery the output isn’t as much in Turbo and it’s shorter too at only about 2 minutes. But that middle output 100 lumens ran for nearly 115 minutes before a sharp decline over the next 20 minutes. On the main LED, the light starts off in high mode in a nice slow fade in, with another press it goes to low, and press again it goes to medium. I would prefer it start out in low, then go to medium and then to High mode. One could argue that if you want low mode you could use the secondary white LED instead of the main one for less output but I think it would be simpler UI wise if they all started in low and left it to the user to bump up in light as needed. On the secondary LED’s the UI is similar. From off if you press and hold the secondary button you get the lower white output on the secondary warmer LED. Press again to get high output. To get red long press from the light being on to activate red medium mode, and to turn off press and hold. The light also has a strobing red feature double click the secondary button from off to get into strobe and double click to exit. Lastly there is lockout and to lock/unlock press and hold both buttons for 3 seconds. The included Klarus branded 14500 battery is a button top, it’s rated for 750mah, the protection cell on my charger didn’t care for this battery and I was unable to run a capacity test. The built in Micro USB charging on the 14500 is pretty slow. In my testing it was 0.34A for pretty much the entire length of charge. This results in pretty long charge times via USB, in my test it took 3 hours go go from full to empty. For a 750mah 14500 battery this is slow. When charging via USB you get a red LED at the top of the cell that goes blue/white when full. You can always throw it in a charger and charge at 1A faster. I wouldn’t recommend charging faster then 1A though. Packaging is small and compact. The box is nice and designed for retail. Inside is a black and red zippered case, that contains the headlamp, strap, and battery. The battery was preinstalled and mostly precharged. The manual had no major translation issues and is available online from Klarus as well. I ended up liking this headlamp more than I thought I would at the beginning. The 3 different emitters are a nice way to give this headlamp alot of ability to cover a variety of situations. For me I this is going to go in my Go/Tornado bag because of it’s dual fuel capability. I generally prefer 18650 headlamps and have a 18650 based flashlight in the bag too, but from reading about peoples experiences after disasters the general consensus there are usually lots of AA batteries available. This headlamp gives me the ability to utilize those if I needed to and give me a headlamp which I find really useful. The case keep everything in one place and all together. While I personally love Titanium and a large part of my EDC is all titanium, It’s really not necessary in this headlamp from a functional standpoint. It does give it more cool and style points though. 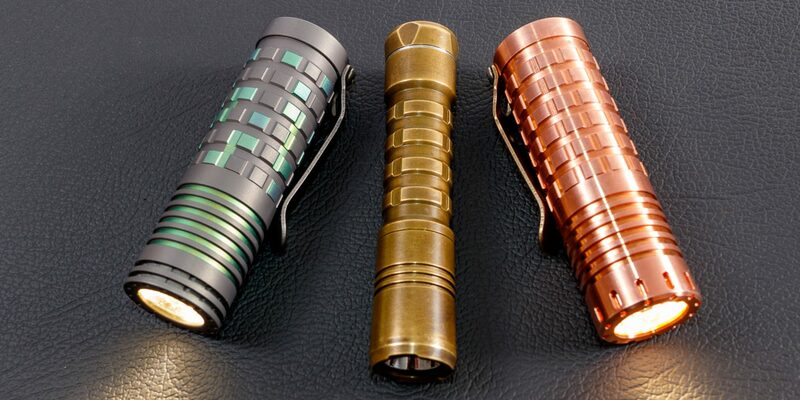 FlashlightZ has told me an aluminum version is coming out later this year which should be a little less expensive. I think it would be cool if Klarus did some anodizing on the titanium version to make it a little more special and help justify the increase in price.